Longtime East Tennessee resident and novelist John Ford Clayton has been named among the finalists for The Montaigne Medal in the Eric Hoffer Book Awards for his debut novel Manipulated. A prestigious international award that honors the memory of American philosopher Eric Hoffer, The Eric Hoffer Book Award has become one of the largest and most sought-after awards for small, academic and independently published titles. Presented annually, the Eric Hoffer Book Award was designed to highlight salient writing and celebrate the spirit of independent presses. Each year, the Eric Hoffer Awards presents the Montaigne Medal to the most thought-provoking books. Awarded in honor of the great French philosopher Michel de Montaigne, who influenced such people as William Shakespeare, René Descartes, Ralph Waldo Emerson, Friedrich Nietzsche, Jean-Jacques Rousseau, and Eric Hoffer, The Montaigne Medal recognizes books that illuminate, progress, or redirect thought. An intense political thriller, Manipulated is a taut, timely, seemingly ripped-from-the-headlines tale that unfolds during the 2016 Presidential election. 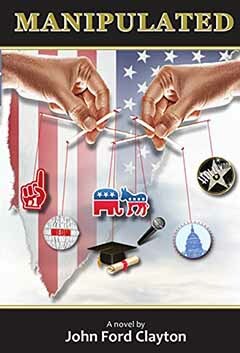 About Manipulated: For over 40 years Victor Youngblood has been working patiently, quietly, and steadily to seize control of the nation’s media, government, political, education, and entertainment structures. With these assets now in his grip, Victor is poised to execute his ultimate plan: conquest of the United States at the foundational level - and it’s all happening right under the noses of an unsuspecting nation. This carefully wrought scheme, designed to come to fruition with the 2016 election, is going according to plan. But then a new voice emerges. And this strangely authentic candidate captures the fascination of the American people. But is it too late? Has Victor’s machine gotten too large to overcome? The stakes are high. And the survival of the nation as we know it hangs in the balance. An extraordinary - and extraordinarily thought-provoking - tale by a dynamic new voice in the world of thriller writing, Manipulated is outstanding. Part compelling novel, part cautionary tale, Manipulated is wholly captivating, and impossible to put down. Kentucky native John Ford Clayton lives in Harriman, Tennessee with his wife Kara, and canine companions Lucy, Ginger and Clyde. He has two grown sons, Ben and Eli, and a daughter-in-law, Christina. John earned a BS in Finance from Murray State University and an MBA from the University of Tennessee in Knoxville. John is active in his East Tennessee community having served on the local boards of the Boys and Girls Club and a federal credit union, on church leadership and creative teams, and on a parks and recreation advisory board. When not writing, John works as a project management consultant supporting Federal project teams in Oak Ridge, TN. Visit John Ford Clayton online, on Facebook and on Twitter. For additional information on the Eric Hoffer Book Award, visit: www.hofferaward.com.